The AUGENMANUFAKTUR hygrometer is a must for all eyelash professionals. With the hygrometer you always have the humidity and temperature in your room in view, crucial for a perfect and long-lasting eyelash lengthening result. 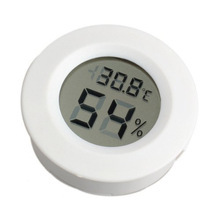 Humidity affects the eyelash glue, but with the hygrometer it's no longer a problem as it keeps you in control.